Konica Minolta manufactures products under its Design for Environment approach, taking into account the various environmental aspects of our products, including global warming prevention, product recycling and hazardous emissions elimination. We assess the environmental impact at each stage in a product's lifecycle, from raw material/part procurement to manufacture, transportation/sale, use, reuse/recycling and disposal. We have established assessment criteria that enables us to take appropriate measures from a comprehensive viewpoint. During the new product planning phase, numerical targets are set for environmental goals regarding items of standard product assessment. During the prototype phase, we check whether the targets are being met. Then we do a final assessment before production, to ensure that only products meeting the targets reach the market. To ensure that products are environmentally sound, it is necessary to check the environmental impact of the raw materials and parts that go into those products. This is why the Konica Minolta Group promotes its Green Procurement Policy globally. To our raw materials and parts procurement assessment criteria (quality, cost and delivery), we have added environmental factors to ensure emphasis on materials and parts with less environmental impact. We have also augmented our Green Procurement criteria with substance assessment, whereby we evaluate substances contained in raw materials and parts to be procured. We also use corporate assessment surveys to evaluate our suppliers in terms of their environmental management systems. This survey data is saved in an information database and shared throughout the Group. To promote management of hazardous chemical substances in the supply chain, strong partnerships have been established with suppliers by conducting on-site diagnoses and providing them with educational support, so as to reduce environmental risks. In July 2006, the RoHS Directive came into effect in the EU market, restricting the use of lead, cadmium, mercury, hexavalent chromium and two types of polybromic fire retardants (PBB & PBDE). Konica Minolta has already discontinued the use of these specified substances in all RoHS-designated products. Also, concerning non-RoHS designated products, we have discontinued the use of these substances in new products released in fiscal year 2005 and onward. By the end of fiscal year 2007, we are planning to phase out these specified substances in all products, excluding some medical instruments and similar items, due to difficulties in procuring alternative substances. We pay particular attention to maintaining a comfortable office environment when we design and develop information technology equipment for office use, such as multifunctional peripherals (MFPs) and printers. To minimize the impact of our products on the office environment, we have been striving to develop products that satisfy the strict criteria of Blue Angel, a standard that rigorously restricts operational noise and emission of volatile organic compounds (VOCs), in addition to environmental impact in the broader sense. During fiscal year 2006, the Federal Institute for Material Research and Testing, Germany, certified two of our laboratories in Japan as institutions qualified for measuring chemical substance emission levels, the measurement of which is required for filing applications for Blue Angel certification. Because of this certification of our laboratories in Japan, we now can gain the data necessary for obtaining the Blue Angel certification for our MFPs within the country where they are designed and developed. This helps reduce both the costs and time necessary for acquiring certification. Moreover, we now can feed back the measurement results, thus improving our products more quickly, which in turn helps us market safe products with greater speed and efficiency. Konica Minolta Business Solutions Co., Ltd., a sales company of information technology equipment in Japan, has established the PPC Paper Purchase Standards, which have been implemented since 2007. The Standards stipulate that copy paper to be supplied to customers should be procured taking into account the impact of forest destruction and degradation on living environments of animals, plants, and people. We have introduced the Lifecycle Assessment (LCA) method, and collect and check data on CO2 emissions throughout the lifecycle of a wide range of products. To effectively reduce CO2 emissions, on the basis of our assessment results, we take measures tailored to each product's characteristics, e.g., products with higher emission rates during the production stage, or with higher rates when in use. Taking multifunctional peripherals (MFPs) as an example, CO2 emissions derived from power consumption when MFPs are used by customers account for the largest percentage of the total CO2 emissions throughout the lifecycle of MFPs. Also, more than 60% of power consumed during the use of MFPs is consumed by the fuser that heats the toner and fixes it to the paper. We have therefore worked to reduce energy consumption during the fusing process as an effective means of making MFPs more energy efficient. Each time we redesign MFPs we strive to realize even greater power conservation. With regard to the toners used for MFPs and printers, we have developed a Simitri Polymerized Toner using a new method called polymerization, so as to substantially reduce energy consumption during production. This Simitri Polymerized Toner is now being employed in many models. As part of its effort toward energy-saving for digital MFPs, Konica Minolta is committed to reducing power consumption during the fusing process, by employing induction heating (IH) fusing technology. 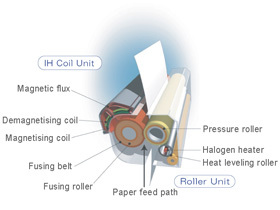 In the conventional fusing process, electric energy is converted into heat with a halogen lamp, and the fuser roller is heated by a thermal conduction system. IH fusing technology allows us to directly heat the fuser roller electromagnetically, and quickly increase the temperature. For this reason, energy consumption in the standby mode can be reduced, greatly contributing to energy conservation. Based on the new power consumption standards of the International Energy Star Program, revised in April 2007. In fiscal year 2005, Konica Minolta released the digital MFP bizhub 750/600, which was the first to introduce the IH fusing technology and realized a significant reduction in energy consumption as compared with its predecessor. The bizhub 750/600 boasted the highest energy-saving level at the time it was put on the market. By applying IH fusing technology to color digital MFPs, in fiscal year 2006, we introduced the bizhub C550 into the market, as the industry's best energy-saving model in the category of color MFPs capable of printing 55 pages per minute. Compared with the bizhub C450 released in February 2005, the bizhub C550 can output ten more pages per minute, while achieving a 41% reduction in energy consumption. Konica Minolta has developed and manufactured a Simitri Polymerized Toner, produced by using a polymerization process to achieve an approximately 40% reduction in CO2 emissions during production, as compared with toners produced by pulverization methods. We use the Simitri Polymerized Toner for many of our MFPs and printers, thereby greatly reducing CO2 emissions during production. Since the Simitri Polymerized Toner can be fused at a lower temperature, it is also effective in cutting power consumption in the fusing process. In 2006, we released the Simitri HD Polymerized Toner, which is capable of fusing and fixing at a temperature about 20°C lower than the conventional Simitri Polymerized Toner, enabling users to further reduce energy consumption by about 15% through using this equipment. Designing products so as to use fewer raw materials greatly helps reduce raw material and energy consumption during production, as well as environmental impact upon product disposal. In keeping with our efforts to design environmentally sound products, Konica Minolta is committed to achieving ever more resource-saving designs. Konica Minolta has continued to offer A4 color laser printers that are more compact and lightweight, by incorporating small-size laser optical units. In 2004, we introduced the 2400W/2430DL, which was about 30% lighter than our previous models, and was the most compact and lightweight color laser printer in the world at that time. As its successor, in 2006 Konica Minolta launched the color laser printer magicolor 2500 series, comprising the magicolor 2550, magicolor 2530DL, and magicolor 2500W, all of which are only approximately 20 kg in weight, ranked among the industry's lightest-weight models of the A4 multi-pass color laser printers (at the time of release). In an effort to help promote further resource-saving, Konica Minolta has reduced the thickness of triacetyl-cellulose (TAC) film—used to protect liquid crystal display polarizing plates—by half, as compared with conventional film. In seeking to reduce the resources used in our products, Konica Minolta has reduced the size and weight of the lens and lens barrel components. These lenses and lens units are used in digital cameras, camcorders and mobile devices, which are becoming increasingly lighter and compact. We promote measures to facilitate the recycling and reuse of digital multifunctional peripherals (MFPs), which combine copier, printer and other functions. In terms of recycling, we have established a Practical Design Manual for Recycling, to enable easy removal of recyclable parts and resources from used products. All outer casing parts for every MFP are made from the same two types of plastic, so as to foster a closed material-recycling loop for recycling plastics from end-of-life MFPs and incorporating them into the manufacture of newer models. We focus particularly on recycling into outer casing parts, which require high levels of appearance, strength and flame resistance. We have installed a crusher for this sole in our recycling facilities, and reinforced the foreign matter removal mechanism for recycling. In so doing, we have enabled the recycling of high purity plastics. Each year, approximately 100 tons of plastics are recycled. Our original Toner Recycling System collects, recycles and re-uses toner that is not transferred to the paper during the printing process in MFPs. Without this system, about 20% of the toner put into a copier would go to waste, but this system eliminates that waste. Konica Minolta has established a system for free-of-charge collecting and recycling of used toner cartridges in Europe, the U.S. and Japan. In North America and Europe, this system is called the Clean Planet Program and is being actively implemented. In North America, the Program is currently under way in the U.S. and Puerto Rico. In Europe, we newly launched the Program in fiscal 2006 in Hungary and the Czech Republic, in addition to 16 countries where the Program has already been in operation. The Program is thus being implemented in a total of 18 countries. In Japan, under a special scheme to certify industrial waste disposal manufacturers for wide-area recycling, the Ministry of the Environment authorized Konica Minolta to collect used copiers, MFPs, and printers as the manufacturer who sold these products. This has enabled Konica Minolta to implement its Program to Collect Used Laser Printers and Copiers, under which such products used by corporate customers are collected and recycled on a chargeable basis. According to relevant laws and regulations, the Program does not cover equipment and devices used by individual customers, since such equipment and devices are categorized as non-industrial waste. Also, in overseas countries, we have carried out activities tailored to the circumstances of each market. In Europe, measures are under way in compliance with the EU directive on Waste Electrical and Electronic Equipment (WEEE). In forest resource conservation, reduction in paper use in offices is important; double-sided printing is an effective means of achieving such reduction. The color digital MFP bizhub C550 realizes high-speed printing (45 pages per minute*) when outputting double-sided color pages, thanks to a paper feed control system that feeds three sheets alternately. 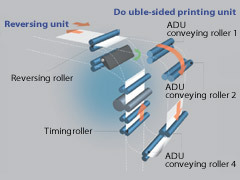 When double-sided pages are output, a roller dedicated to reversing the paper also helps secure productivity equal to one-sided printing. The bizhub C550 thus makes it easier to use double-sided printing, and supports our customers' efforts to reduce paper use in their offices. When A4 size paper is fed in widthwise.